Choose when you would like your media to be available by default. You can set your preferred Default Availability for all your media. This option gives you great control if you have specific availability requirements and don't want to change the availability options for individual Media and Playlists individually. For more information checkout our Content Management information page. To set your global default availability of your media you will need to go to ⚙️ Settings > 📆 Availability. Online / Video is ON - This is the default setting and means that all your videos are available to your viewers by default. Specific Date & Time Scheduling - Here you can choose a Single specific start and end Date & Time for when your media will be available. 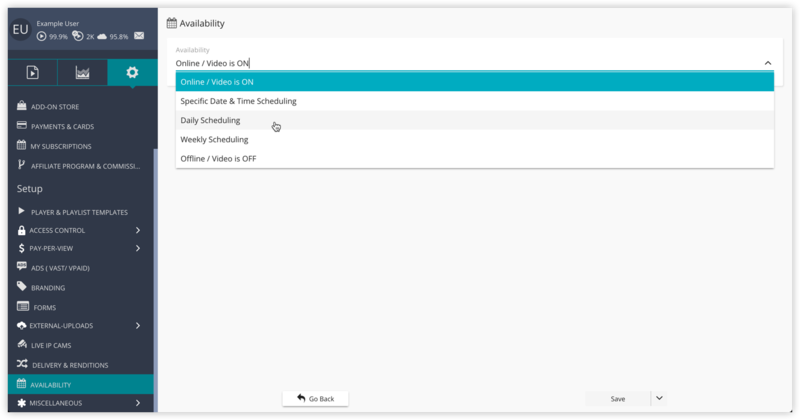 Daily Scheduling - Here you can choose a specific Daily start and end time for when your media will be available. Weekly Scheduling - Here you can choose separate daily start and end times for each day of the week. Offline / Video is OFF - This setting disables all media by default meaning your media are not available to your viewers until you enable them individually.